by Harris, Muriel, Professor Emerita; Kunka, Jennifer L.
For first year composition courses. The Prentice Hall Reference Guide, 10th Edition is a tabbed, spiral-bound handbook written to help all writers quickly find the information they need, without necessarily knowing the proper terminology. A series of “portals” guide learners to the answers to writing, research, and grammar-related questions. The compact, four-color design makes this book easy to use. The result of many years of field testing, this handbook offers guidance at every stage of the writing process from instructors who have over 30 years of combined experience, all while using language students will understand. The 10th Edition has been extensively revised to provide the most updated and easiest-to-use writing instruction. It now features more coverage of critical thinking and reading, and examples of interactions with texts, student writing, and explanatory graphics. 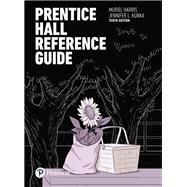 Prentice Hall Reference Guide, 10th Edition is also available via Revel™, an interactive learning environment that enables students to read, practice, and study in one continuous experience. Learn more. Muriel Harris, Emerita Professor of English, Purdue University, started the Purdue University Writing Lab in 1975, with the help of several graduate students. Later, with graduate student assistance, she developed the extensive OWL website of instructional pages on writing skills and grammar. Drawing on this experience, she authored The Prentice Hall Reference Guide and The Writer’s FAQs, both later co-authored with Jennifer Kunka. These books originated after explaining to a Prentice Hall editor that composition handbooks are unhelpful because too many students found them difficult to use. When the editor challenged her to write textbooks that would be student friendly and easy to use, these reference handbooks were her answer and have since gone through multiple editions. Harris also initiated and continues to edit the Writing Lab Newsletter, now renamed as WLN: A Journal of Writing Center Scholarship. She continually champions writing center collaboration as a highly effective instructional context for working with writers. Because of her fervent interest in helping writers develop into effective communicators, she is firmly committed to one-to-one collaboration between tutors and writers as a particularly successful partnership with classroom teachers of writing. Her CV list of books, book chapters, articles, and conference presentations, all of which focus on the theory, pedagogy, and administrative work of writing center professionals, is available on the Purdue University Department of English’s website section for retired faculty. She is most proud–and awed by–her husband, their children, children’s spouses, and grandchildren. Jennifer Liethen Kunka is an Associate Professor of English and Director of the Writing Center at Francis Marion University. She earned her Ph.D. in English from Purdue University, along with a secondary specialization in feminist theory and women's studies. She teaches Business Writing and British Literature. Her research involves writing center theory and practice, tech-enhanced writing, and research writing. She also is a specialist in 19th and 20th-century British literature, focusing on issues of gender and class in the novel. Dr. Kunka served on the original Gender Studies Steering Committee, and on the Gender Studies Advisory Committee.